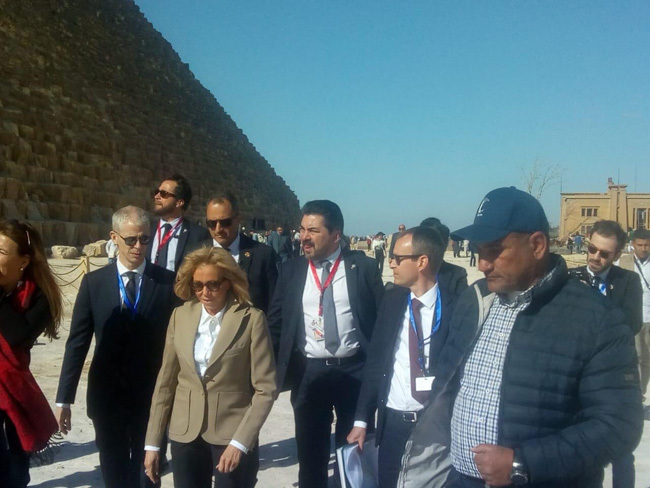 French first lady Brigitte Macron visited on Wednesday the Giza pyramids in a two-hour tour where she saw the Great Pyramid of Khufu, the Sphinx and the Giza solar boat. The first lady was accompanied by the general manager of the Giza plateau Ashraf Mohi. French President Emmanuel Macron and the first lady arrived Egypt on Sunday for an official three-day visit, starting with a trip to Abu Simbel Temple in Aswan. The trip to the citadel, which overlooks Islamic Cairo, lasted for around an hour.